December is a special month as we celebrate and bring 2017 to a conclusion. There are so many Christmas Community events I can’t mention them all, so check traditional and social media. A few of quick notes. On Thursday, December 7th the popular’ Sights and Sounds of Christmas’ returns, in downtown Newark, starting at 6:00pm at Second Presbyterian Church. This walking tour of downtown churches benefits the County Food Pantry Network with your donations. Also, on Saturday, December 2nd at 2:00pm the Second Presbyterian Church will host a ‘Christmas Carol Sing-A-Long’ with sweet treats and punch provided! Pataskala Mayor Mike Compton tells me his community is having a Christmas Cookie Walk and Parade on Saturday, December 2nd. Four hundred ‘Cookie Walk’ tickets are available for $5 each, and the walk is in the downtown at area businesses. Then at 6:00pm the ‘Lighted Christmas Parade’ steps off on Main Street headed to the Park and Pool, with Jolly Old St. Nick! Harrison Township Trustee Mark Van Buren says the annual Outville Christmas Parade will be Saturday, December 9th at 3:00pm, leaving from and returning to the Township Complex. After the parade Santa will preside over the annual ‘ham and bean soup dinner’ and community celebration! 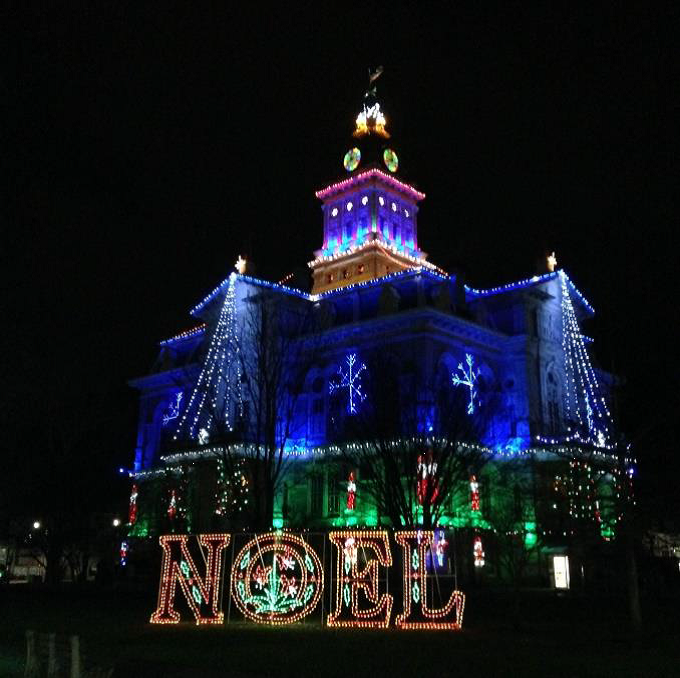 The 69th annual Courthouse Holiday Lighting is planned for this Friday, November 24th. As in the past this community event will bring thousands of ‘children of all ages’ downtown for the festivities! The longtime Christmas holiday tradition will feature the return of decorations on the historic and restored 1876 Courthouse and on the lawn of the Courthouse Park. The community will also enjoy the new colored LED lights on the top of the Courthouse and on its Tower. A special community sing-a-long is planned for this Friday evening, November 24th, and Santa and a special guest will arrive around 7:00pm that evening to kick-off the Christmas Season in Licking County. Also, this year the Courthouse Lighting Committee is pleased to again of their host their annual Christmas Market. Fully decorated, the Market will feature hot chocolate, 40 market food and craft vendors and two food trucks the afternoon and early evening this Friday, November 24th from 3:00pm till 6:30pm. Holiday celebrants can come to downtown Newark this Friday afternoon to enjoy the Canal Market District and stay for the evening festivities at the Courthouse Square! See you in downtown Newark on Friday! The Newark-Granville Symphony brings to the community “A Very Merry Holiday Pops!” concert. This will be Sunday, December 3rd at 7:00pm at the Midland Theatre. Join the Newark-Granville Symphony Orchestra along with choirs from Newark and Granville High School for this annual tradition. 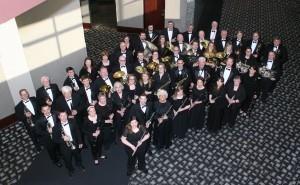 The orchestra will be led by Dr. Russel Mikkelson, professor of music at the Ohio State University, and the narrator for the evening will be Shawna Corder. This evening promises to be a great start for the holiday season with a visit from Santa. Call the Midland Box Office at 740-354-5483 or visit www.NGSYMHONY.ORG for ticket information. Also a note to the community - a special New Year’s Eve Gala performance is planned for Sunday evening, December 31st at 8:00pm at Weathervane Playhouse in north Newark. This event is ‘Celebrating 50-Years of Weathervane Playhouse. Featured will be the Newark-Granville Symphony in concert, along with Cocktails and Hors d’eourvres, DJ and Dancing, Jazz Piano, and a Countdown & Midnight Celebration. Laura Portune will be joining the Ensemble that evening to sing. So, make sure you bring your singing voice for the annual sing-a-long. The evening will conclude traditionally with Leroy Anderson’s Sleigh Ride. 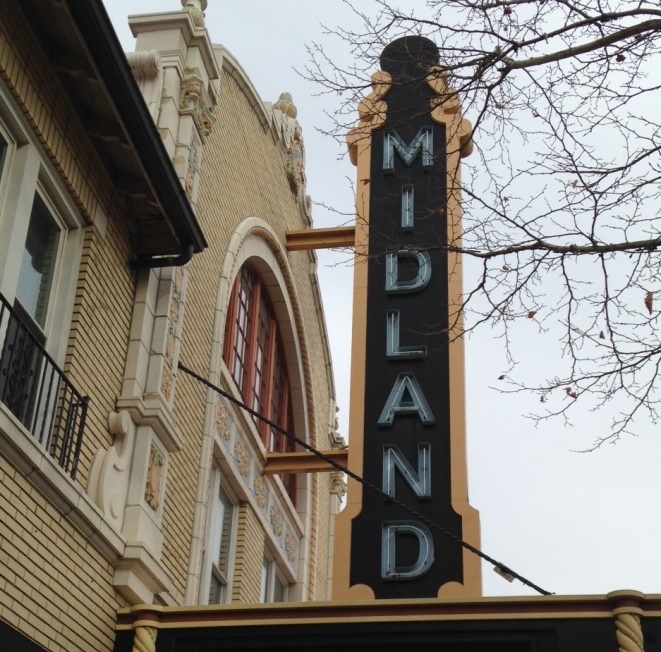 * Again, note the change of venue – the Midland and not the Reese Center. Tickets at the door at the Midland are $15 for adults, $10 for seniors and students $5. Leave the hustle and bustle of modern day holiday celebrations behind and enjoy an evening visiting four historic houses, all decorated for the season. The two locations are at Veterans’ Park, North 6th Street and 303 Granville Street, both in Newark. These annual Christmas Open Houses will be Saturday, December 2nd from 5:00pm till 8:00pm. The historic Sherwood-Davidson House Museum (see photo) will be celebrating “Yuletide Weddings.” Wedding gowns from six different eras will be displayed with room décor to match. 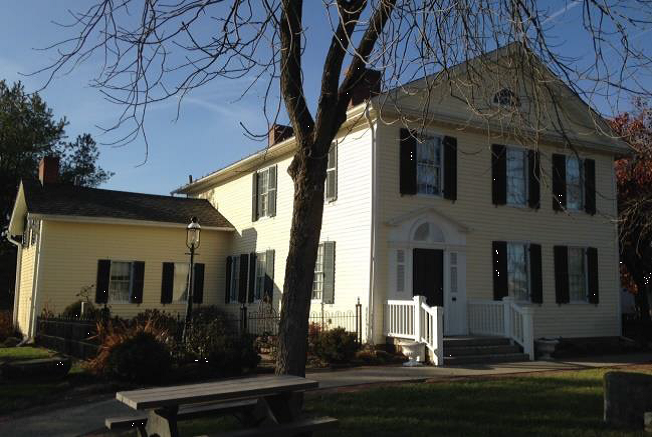 At the Buckingham Meeting House, visitors may enjoy entertainment by John Sheets and Rocky Fork while warming up with hot cider, coffee, hot chocolate, and wedding cookies and cakes. There will be a children’s craft and a chance to visit with Father Christmas. Also in Veterans’ Park, The National Heisey Museum and King House will be open with glassware sparkling amongst Christmas decorations. The Webb House, five blocks away will feature luminaries and a “Season’s Greetings” décor. The 2017 season of orange barrels is concluding with the near arrival of winter. Here’s a quick ‘play of play’ of where we are at heading into December. On November 17th two major City of Newark projects opened. The new and wider bridge carrying Mt. Vernon Road or State Route 13 traffic over the expressway and into downtown opened, much to the delight of motorists. Completion work on the site will continue into 2018. That same day the section of North Third Street, from the NW Roundabout north to the Elks reopened to traffic as well. This includes the intersection of North Third and West Church Streets. This continues the major $19-million City Sewer Separation project in the downtown. 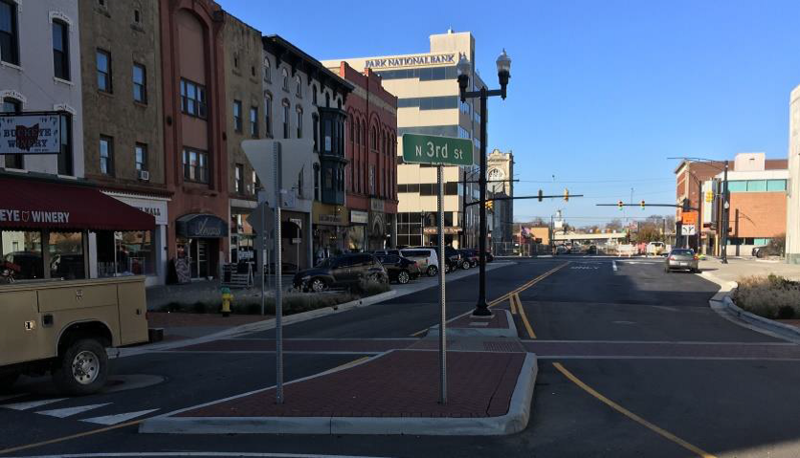 Work will continue on North Third Street and on Church Street between Second and Fourth Streets in 2018. In western Licking County three ODOT related project are complete. The Cherry Valley Road interchange on State Route 16, the new diamond interchange and Mink Street Road and State Route 161, and the new wider bridge at I-70 and State Route 310 are done. Work to widen State Route 310 through Etna and to the U.S. Route 40 interchange will continue in 2018. 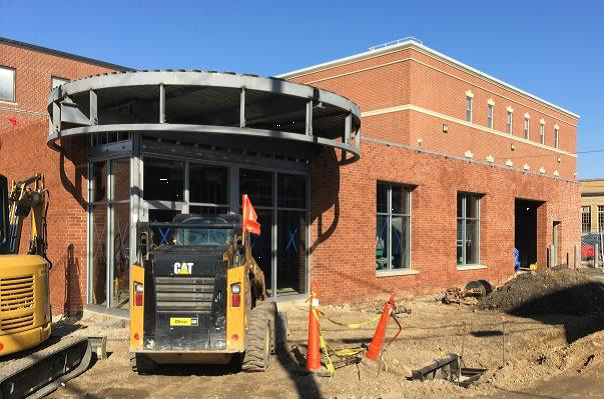 Finally, the County’s $4-milllion restoration of the East Main Street (CSEA) Administration Center and the addition to the rear of a new Records and Archive Center is about half complete, and expected to be finished in late spring to early summer of 2018. NEWork is located at 14 North Park Place on the Square. 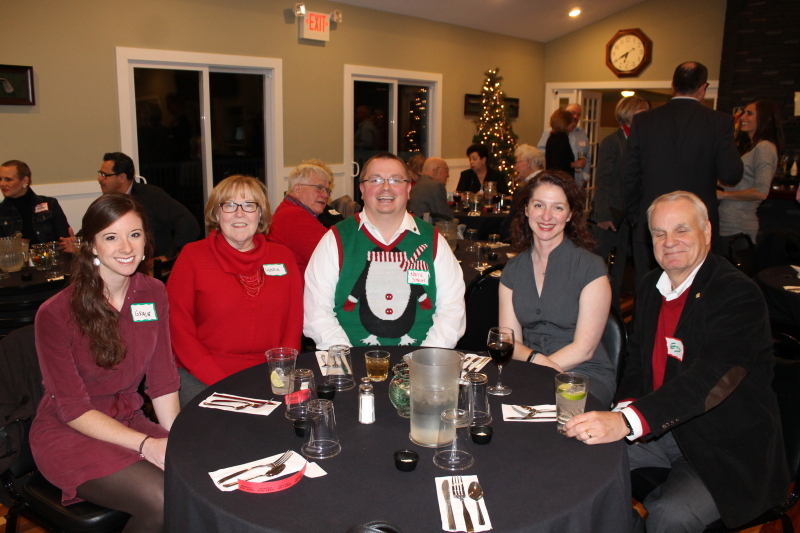 The owner partners in the venture are John and Sarah Wallace of Granville, and Fred and Teri Lowinger of Chicago. They were joined by Newark Mayor Jeff Hall for the official ribbon cutting. floors are desk and office working space for rent either short or long term. In addition three loft apartments, for lease, are being finished. Schooley Caldwell Architects and Hopewell Builders designed and developed the historic three story building into modern office space with an eye toward retaining the historic character of this 19th Century downtown landmark. Visit www.NeWorkspace.com for more information. In this December Update I am continuing a several part series on the area’s amazing collect of art in public locations. Let’s begin with a familiar piece on the east side of the public square in downtown Newark. The sculpture is titled “Crossing Paths” and these ladies have been conversing for a number of years. 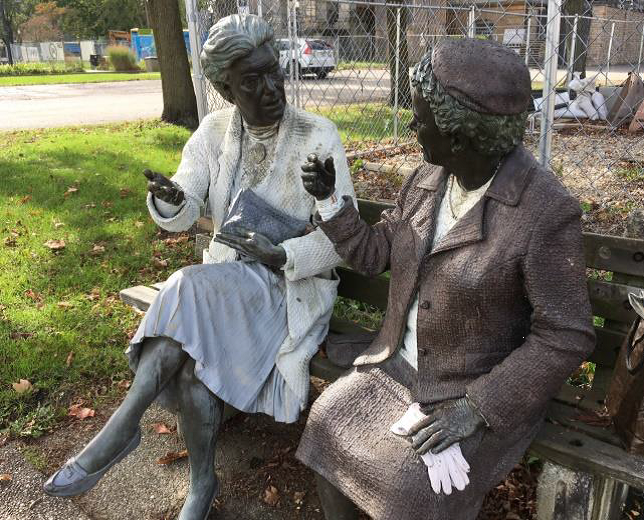 Artist and sculptor Seward Johnson is credited with this work (photo above) that was donated by the Thomas J. Evans Foundation. Public art, whether at the Newark Campus, the Licking County Main Library, the Licking County Administration Building, the Midland, in Granville, the Courthouse Square, Canal Market District, along the bike paths and a number of other locations, has added considerably to the local quality of life. This piece (photo left) by sculptor Gary Lee Price is one of a series on the Newark Campus of OSU-COTC. The collection is called, “The Creators‟. 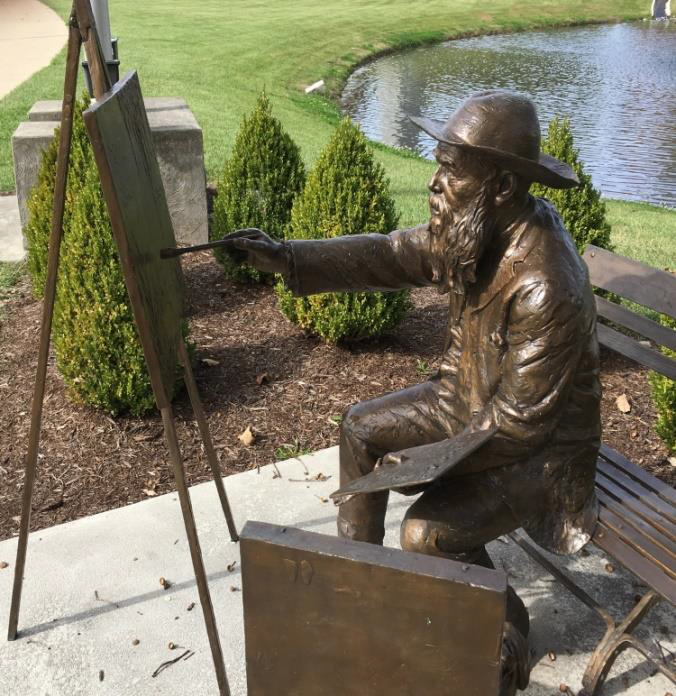 This piece shows famed artist Monet working at his easel by the ponds on the Newark Campus. The T. J. Evans Foundation donated “Monet” and several other works, described in the words of creator Price, “All mankind becomes the beneficiary of great ‘Leaps of Faith’ and oftentimes we marvel and stand in awe at these Great Ones and their contributions to humanity”. Another familiar piece stands by the Buckingham House in Newark’s Veterans Park (West Main and South Sixth Streets) and honors one of our own - John Lincoln Clem. Johnny Clem was born in Newark is considered the youngest ever to serve in the U.S. Army. Clem ran away from home at the age of 9-years and 10-months to fight for the Union in the Civil War. 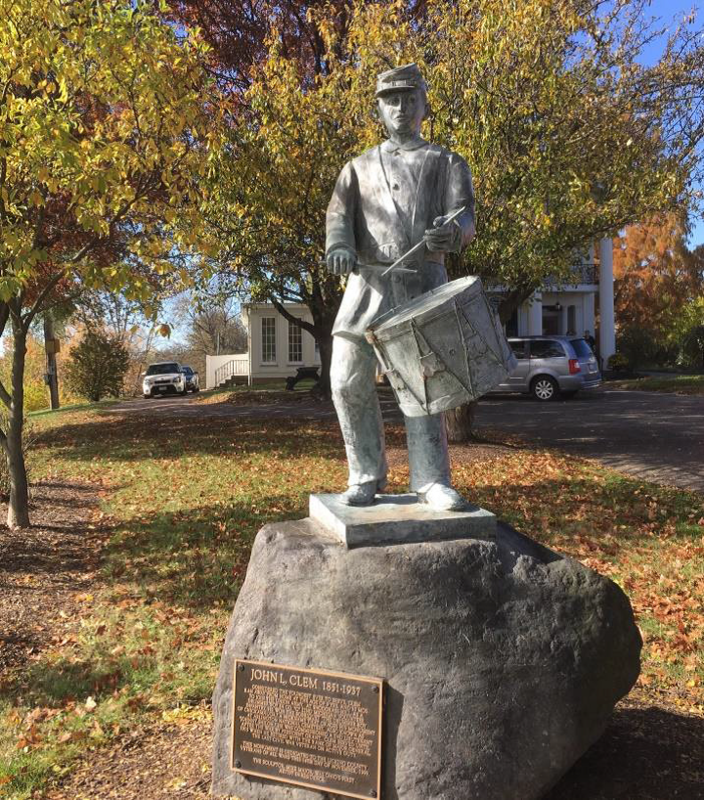 At Snodgrass Hill, as a ‘Drummer Boy’ in Company ‘C’ of the 22nd Michigan Volunteer Infantry, he won the sobriquet ‘The Drummer Boy of Chickamauga’. It is this nickname that graces his monument at Arlington National Cemetery. Also, known as ‘Johnny Shiloh’, Clem was commissioned a 2nd Lieutenant after the war by President Grant. Clem served until 1915 was retired with the rank of Major General. He was the last Civil War veteran on active duty. This impressive sculpture by Mike Major was dedicated to the Veterans of Licking County on November 14, 1999.
been seen for decades; when in the last century the opening on the north roof of the building was covered to prevent leaking. The skylight would have been needed when the Courthouse was constructed (1876-78) before electric lighting. However later it became dark and forgotten. You can see the original steel frame was stripped and painted gold, broken glass panels were removed and replaced, and modern LED lighting from above provides the light source. 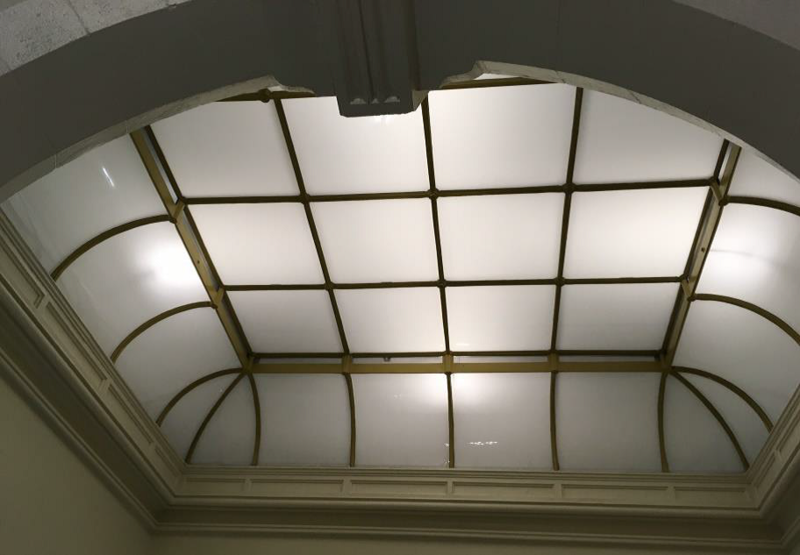 Dozens of regular Courthouse employees and visitors have remarked about the ‘new’ skylight, only to learn that it was been in the building and in a prominent place since the 19-century! I hope you enjoy this continuing look at public art, and take time to visit and appreciate them in the places where they are featured. 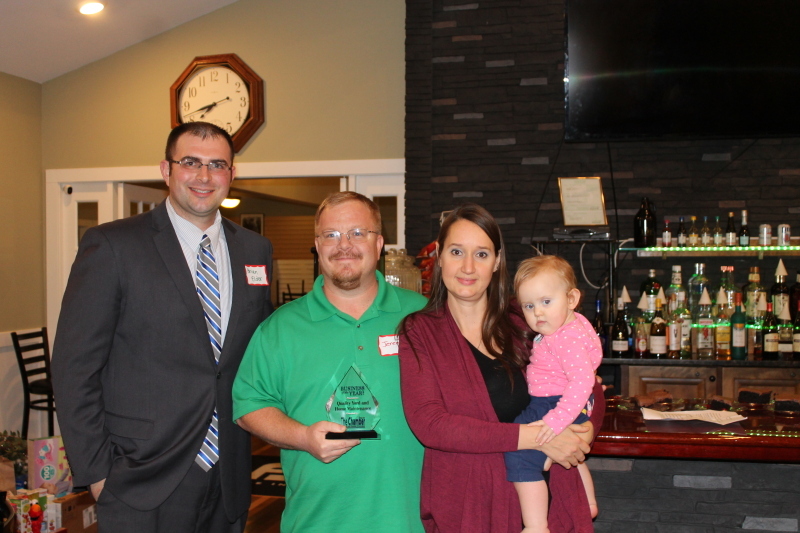 On November 19th the annual „Inscho-Beasley-Mayfield Veterans of the Year Awards Event‟ was held in downtown Newark at the Elks Ballroom. 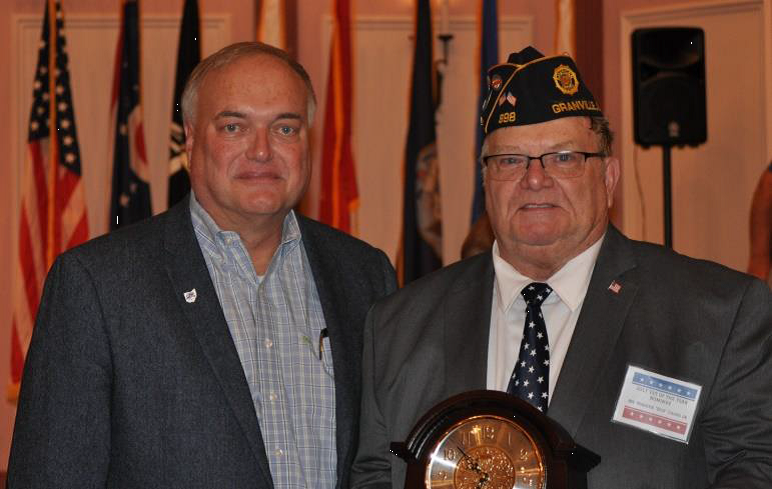 Honored as Licking County‟s „Veteran of the Year‟ was Warren L. „Bud‟ Chase Jr., representing Granville American Legion Post 389. Warren Chase served as a U.S. Marine from 1966 till 1970. His contributions “giving back‟ include: supporting Honor Flights, Flag Raising and Color Guard events, distributing gifts to veterans in senior centers and supporting the Tribute to WWII Vets at Denison University. 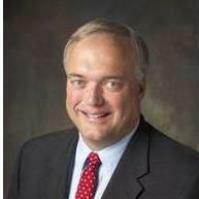 (photo) Warren Chase with Commissioner Tim Bubb. Commissioners Duane Flowers and Bubb were honored join in the Awards Program arranged by the Licking County Veterans‟ Service Commission. Several others nominees were recognized for their service and community contributions including: Gary L. Wimer (Air Force), Kenneth W. Crase (Army), Fredrick W. Collins (Navy), Marvin G. „Mick‟ Dunlap (Army), Sherwood A. Conner (Marines), Raymond E. „Gene‟ Shell (Army), Charles H. Sullivan (Air Force), and Frederick L. Lavery (Army). This event is named in honor of Licking County‟s three „Medal of Honor‟ winners. They were Leonidas H. Inscho (Civil War - Army), Harry C. Beasley (Spanish American Way - Navy), and Melvin Mayfield (World War II – Army). The Licking County Senior Citizens Levy Advisory Review Board has outlined its plans for the 2018 allocation of funds for Senior Citizens Services in the County. The Board will consider applications for funding for the year 2018. Funded services include such needs as providing home health care, transportation, nutrition and other supportive services for senior citizens 60 years of age and older. Questions regarding the on-line application process, contact Pam Jones at 740-670-5114. Hearings will be held Thursday, January 25, 2018 and Friday, January 26, at the County Administration Building, 20 South Second Street, Newark, Ohio. 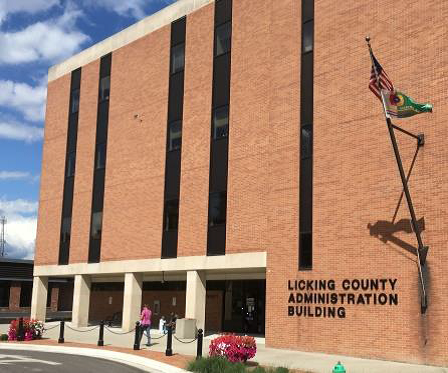 The Licking County Senior Citizens Advisory Board will review said requests of service providers and make recommendations to the Board of County Commissioners for final approval. 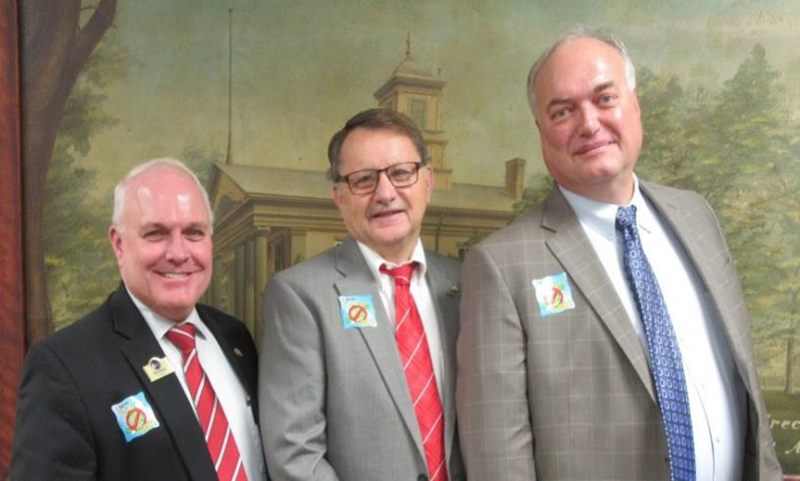 The Licking County Commissioners join with the Licking County Health Department in reminding you it is time to get a „flu vaccination‟ for 2017-18. The annual arrival of influenza virus is here in Central Ohio, and getting your „flu shot‟ can prevent you from developing influenza, a serious and sometimes fatal sickness. I am joined by Commissioners Rick Black and Diane Flowers (above) in wearing the „Flu Shot‟ sticker emblematic of the vaccination. Flu shots are available at the County Health Department and in hundreds of local doctor‟s offices and pharmacies. The $397,200 grant, which is collaboration with Knox and Perry County Health Departments, will increase each community‟s capacity to provide the tools and resources necessary to help residents quit smoking. Cancer, heart disease, and chronic lower respiratory disease are among the leading causes of death in Licking County and are all causally linked to tobacco use. During the first year of the Community Cessation Initiative, LCHD will coordinate the work of partnering health departments to assess local cessation services, develop a referral infrastructure for community agencies, launch and promote services in each community, provide encouragement and re-engage anyone who has experienced a relapse, and conduct quality assurance reviews. ‘Best Wishes’ enjoying the Courthouse Lighting and the month of December, and as we prepare for the joyous Christmas holiday and the beginning of 2018!